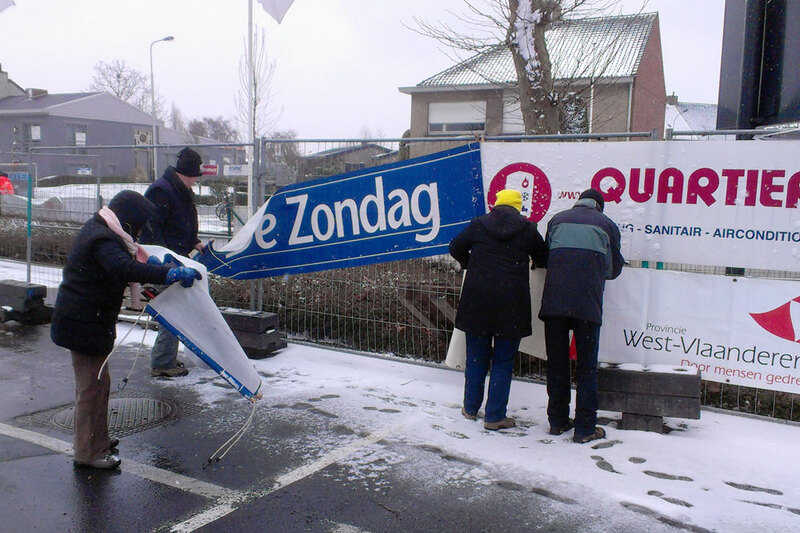 The 2013 edition of Belgian one-day race Kuurne-Brussels-Kuurne has been cancelled as overnight snow fall in Flanders rendered conditions too risky. The organisers held a crisis meeting on Saturday evening. After a Sunday morning meeting and consultation with the police, the final decision to cancel the race was made at 1115 CEST, an hour before the projected race start. “The police evaluated the whole course and it’s too dangerous: too dangerous for the cyclists, too dangerous for the public and too dangerous for the security on the course,” said mayor of Kuurne, Francis Benoit. The contingency plan had been to remove the course’s cobbled climbs and opt for a main road route, but that did not prove possible. The Kuurne peloton were in their team buses at the start line when they heard the news. Defending champion Mark Cavendish was one of those disappointed after travelling to Belgium looking to take another victory. The race is also a rare opportunity for smaller teams to benefit from television coverage and nation-wide publicity. Kurt Bogaerts, manager of the AnPost-Chain Reaction team, was disappointed but believed that the organisers made the right choice. “It’s a hard decision for the organisation because there are a lot of sponsors and PR, but at the end of the day it’s the only decision,” he said. “Tonight we might regret that we didn’t race, but there are no accidents. This is the third time that Kuurne-Brussels-Kuurne has been cancelled in its 68-year history after previous annulations in 1986 and 1993.